Tony Solomon never wanted to be a time traveler. But when a freak accident gifts him with the ability to travel in time, he becomes an unwilling initiate in the Saturn Society, a secret society of time travelers. Determined to prevent his daughter’s murder, he violates the Society’s highest law and becomes a fugitive. But the Society refuses to tell Tony how to time-travel within his own life, so he seeks help from Charlotte, the woman whose life he saved during a prior trip to the past. When Tony arrives in 1933 looking for answers, Charlotte is both thrilled and terrified to see her childhood hero. Loyal to the Society, she is honor-bound to bring to justice those who manipulate time for their own gain. In giving him sanctuary, she faces a terrible choice-condemn the man she loves and to whom she owes her life, or deny her deepest convictions by helping him escape and risk sharing his sentence. This is another author I found while I was at the Lori Foster Reader Author Get Together. I met her and Shawntelle Madison will waiting to take to another author who had a longer line. I have to admit that I was a bit afraid to read this series because it's set in Ohio, and for some reason I have the hardest time reading books set in my home state. However, I had nothing to worry about because this started off with a lot of action and didn't stop. 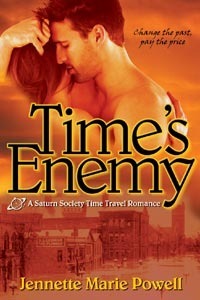 I loved that this was not your typical time travel romance. It's told from a male's pov, and is a bit like the movie Jumper. Tony Solomon was on vacation and was on top of a pyramid when he suddenly finds himself thousands of years in the past Without knowing why, he finds himself back in the present in the hospital. He's visited from a group from the Saturn Society, but before he can find out what they are about their representative gets thrown out by security. Tony returns home from vacation and thinks that what happened in the past was just a dream or something. Then he wakes up to find out he's two years in the past. He returns home without knowing quite how he did it, and is again visited by the Saturn Society who tells them that he's a time traveler now because of what happened to him in Mexico. He doesn't really want to believe them, but knows that there isn't any other explanation for what happened to him. He and his wife have become distant from each other since the death of his daughter, and when Tony realizes he can time travel his first thought is to travel back in time and stop her death. He's warned against it, but is determined to find a way to do it. On one of his time travel trips he meets Charlotte, and saves her from a devastating flood. What I loved best about this was how accurate the descriptions of Dayton in the past were. There was a flood that pretty much wiped out everything in it's path, and the only thing that saved the town was NCR (National Cash Register Company) being on top of a hill, and they helped a lot of the survivors. It was nice seeing how much the town has changed over the years.